Configure the settings and hit ok. In a race when you’re next to the race marker press the LAP button, the distance will now be corrected to the nearest lap position (eg 5.08 will correct to 5, 8.8 will correct to 9, …). After pressing the lap button the distance will be adjusted and all averages will be recalculated against this new distance figure. When you miss a lap marker don’t worry: do not press LAP and go for the next lap marker. Note: Adjusting the distance by pressing the LAP button has no influence on the recorded distance. (When you come home and look on Garmin Connect the distance will be the recorded GPS distance). If you turned off auto-lap you will see where you pressed the lap button and which mile/kilometer marker corresponded with which GPS distance. Test the data field on a training session so you’re used to the layout. Have a second screen with a native data field configuration as a precaution. After donation you will receive a donation key on your paypal email address which which will remove the “Like it? Donate!” message from the data field. (this is a manual process, but normally you should receive a key within 24 hours). Great feature, but nevertheless due to GPS error I was mislead and almost missed my new PB on my latest marathon race. Excellent. The synchronisation with KM markers is just what I had been looking for. Would love to donate, but PayPal requires that I set up an account with them – something that I will not do. Any other way to donate? hi John, glad you like my app! Alan had a while ago a similar question, I made this page for him http://starttorun.info/about/ If you use this donation button you don’t need to create an account and you can directly use your credit card or visa. Thanks for that – done! Thank you! This is what ive been looking for! I will test it today and during 10K race this weekend and donate. I usually do it the “manual” way, Put datafield with LAPS, AVERAGE LAP and manual lap every KM. Then AVERAGE LAP will give me correct pace but I still need to calculate how far im behind etc. I have a idea for a NEW app, and it should be pretty easy to build based on Peters Race Pacer. Example: In Oslo, Norway, we have a indoor track which is 546meters one lap. Every time you run a track and press LAP it should calculate distance. DISNTACE = DISTANCE + 546m, or just like 546m * LAPS. And one field for last pace. If you run a round in 2:11 it will be 4:00 pace (2:11 for 546meters = 4:00 pace). This is harder for people to calculate on the fly. This app would also be pretty usefull for outdoor track running, Since the watch always know that a LAP press = 400m. Peter’s (Race) Pacer totally saved me on the Copenhagen Marathon. During the last couple of training runs prior to the race, my Fenix 5x had an issue with the GPS and repeatedly got both pace and distance (and GPS trace) wrong. So on race day I didn’t trust the expensive watch. But with Peter’s (race) Pacer I knew that I could get a reliable lap time every official 1km, and that allowed me to pace myself successfully and beat my PR by over 10 minutes. Thanks for the kind words Tomas. And big congrats on beating your pr! Way To go! Hi Peter, thanks for implementing the idea of readjusting the distance run by pressing a button at the distance markers. I suggested this idea to Garmin about 2 years ago, with no reaction whatsoever. I have no ConnectIQ capable watch yet (“only” a FR620) but if I ever will, this app will be mine! I also own a FR610 with a footpod, and followed fellrnr’s recommendation to calibrate the footpod, but still found it less accurate than the GPS distance measurement (pace round value). The screen could still display the GPS pace in one of the data fields if one so wishes. all data (including pace, avg pace, eta, etc…) is recalculated on the fly based on the adjusted distance. BTW any plans to integrate / display pace from footpod, like the “Foot Pod Pace” data field? Momentary pace from footpod plus distance correction by mile marker, that would be killer! For direct ant connections i don’t have enough memory left but if you pair the footpod with your watch it should already use that as the source for speed. great app i just donated !! Hi Peter, it’s me again. I just ran a 10k race (Straßenlauf Dachau, https://connect.garmin.com/modern/activity/1911456331) and the data field helped me control my pace just fine – but. As long as the auto lapsize is equal to the lapsize set in the settings this should give no problem (on my own races I also set autolap on). I don’t influence the current pace, I just take over whatever value the connect iq framework passes on to me. But I’m sure you noticed that I offer other options for pace: avg pace, lap pace, smoothened pace, perhaps one of those will suit you better, the first two take the adjusted distance into account. 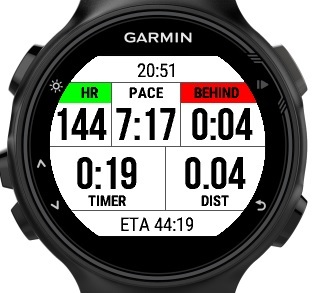 Behind/Ahead field is also based on the adjusted distance, the behind/ahead field is the field I look at the most when I race and is one of the reasons I created the race pacer spinoff which I’ve named Peter’s Ahead Timer ( https://apps.garmin.com/en-US/apps/5751dbc6-40ab-425a-8ca4-e3afdd10eddf ). Question: my aim is to run 150 km during a 24 hour run. Will this help me? Also my laps will be 934.8 meters. I guess that is not going to help? The lap size can not be a float value in Peter’s (Race) Pacer so instead of 934.8 you would have to set it to 935 meter, so that’ll give about 400 meter of difference at the end of the day, but the distance will be more correct than what GPS distance can give you. If you account this for in your target distance (set it a little bit higher) the ahead/behind time should be able to guide you to your goal. I would recommend to turn autolap off and to manual lap only when you start a new lap (you don’t have to do this each lap). Either way try the field out before race day to train with it and good luck with your race. Just some questions as I did a demo “run” (sitting behind my desk). 1) I managed to install and used 09:35 min/km (there was no field for target finish time…). 2) Also, I faked a run and of course as I was just sitting behind my desk I was “behind” immediately. So I cheated and pressed the lap (935 m) button a few times. But I suppose your app did not take it as it was outside any reasonable margin since I had not moved? 4) I know I should read the manual but I am lazy… Let’s say Garmin believes I ran 930 meters, but the lap really was 935 and I lapped manually. Does this mean the values of Garmin will be “corrected” or does you App distance then deviate from Garmin? 2) I tested this and when I was close to a lap it would the difference, if I was far off it would not. That is according to design I assume. 4) I believe not as the test showed a discrepancy as per design I assume. By the way…I have been looking for this functionality (i.e. combination of ETA, lap adjustment, behind/ahead) for years. Perfect if you run long distances that consist out of many laps. When you press the lap button the distance in Peter’s (Race) Pacer is corrected, but this will not affect the real gps distance you have covered. The distance reported after the fact will always be the gps distance, but during running you see the adjusted distance. (In your example the gps distance will remain 930m, while the data field will report 935m). Today I bought an FR935 and tried to install Peter´s (Race) Pacer – unfortunately unsuccessfully. On the FR935 it´s software/firmware version 5.4 and Garmin Express says that it´s the newest version & everything is up to date. However, when trying to install the data fields/app Peter´s (Race) Pacer (version 4.1) it get this message: This app requires an update of your Forerunner 935. Please use Garmin Express to update your Forerunner 935. -> Garmin Express states that all is updated. 1) I have a Fenix 3 HR. I prefer to use the “data field” rather than the “app”, because it gives me access to other data fields. Am I correct in assuming the only things missing compared to the “app” (because the Fenix 3 HR has low memory) is the pre-race screen, and the ability to write the historical data to the FIT file? 2) Any plans to implement negative splits in the future? Example is “Race Pacer”. Should be relatively straight forward to implement; just apply a linear factor to the pace target based on position through total race distance. 3) What happens if my watch gets a massive spike and is effectively 600m out (with auto lap set to 1.0km). Let’s say true total distance is 1km, but Garmin recorded total distance is 1.6km. When I press “lap” button, will your app round up to 2km? If so, is there anyway to fix this? (hopefully such a large GPS spike never occurs). 1/ I understand, I prefer the data field version myself too. Because the data field on CIQ1.x only has 16k memory I can not include all features there, but I’ve included the most important ones: all essential features are in there. The features not available in the CIQ1.x data field version are: pre-race screen, record ahead time to the FIT file, the ability to specify the target finish time or target speed (you have to specify the target as target pace), less data field options: no cadence, power, lap speed, lap time. 2/ Yes, but it will be a different app. 3/ The lap button rounds off to the nearest lap size multiple, so 1.6 would round to 2k. I’ve never experienced such a situation as you describe but if such a situation would present itself the only way to fix it would be to fix it gradually in the coming kilometers, eg wait till 2.4k and push the button and then at the 3k point marker correct the distance again. I’ve just received a new 230 and am still quite unfamiliar with it. However, I realised to my disappointment that Garmin did not include the Virtual Trainer that I loved from my previous 620. Your appears to fix this. However, it appears the 230 lacks the initial screen (presumably due to lack of memory), however I cannot see a way of configuring the distance and desired race pace. Can you add some more detail? I relly like this app. Pace = current pace that the watch is reporting. So the smooth pace can be used to even out gps instabilities. that should be a very good app for my first marathon. But i´ve a little Problem…. I use the Forerunner 235. (Display before starting the race). Why can I not sho on the top Middle the Lap-Pace ?? But one thing is still missing in Peter´s Pacer….. Smooth Pace (Speed), in what for Unit ist this ? min/km or min/mile (km/h or mpH). It depends on the settings you have set on your watch to be either statute or metric. Speed is either in km/h or mile/h, pace is either in min/km or min/mile. Hi, i donated but forgot to mention that it was for the race pacer. Used the same mail as below. In my opinion the app need One more configurable field. Maybe in timer slot. And the top and bottom fields a Little bigger. I don’t have enough memory available to import a custom font, so I have to work with the available system fonts (I can’t make these bigger, they are as they are). What would you place instead of the timer field? For use of many people the timer is less important of other field. For example sometimes i don’t see the last lap time when the Watch show It and After some second/minute i want know it and i must search in other screen. The true is the original screen give us 4 configurable fields, your app 7 field so is fantastic!but only 3 are configurable, so 1 field less then original and for someone is a Little imperfection. I can see the advantage of a lap time while doing interval training, but I can’t see the use of this while racing and I would like to keep this field race-focused. I will likely release a more general field with the same layout though, so that may be more suitable for your use case. is it possible to have the pace value in the top center a little bigger? It would be great to have the first line with just two fields, with peace and “behind” fileds more visible. Hi, used the datafield today for the first time and tried to use the distance calibration by using the round button. Seems that in my case it doesn’t work well…..distance was not recalibrated. Do I need to switch off the autolap? The round button? Are you using a vivoactive3? Manual Laps are taken by double tapping on that device (and you also need to enable Manual Laps in the run settings first. using a fr935…think it works well now. install a 2nd time an it looks good. AutoLap of the FR can be active,altough by using the lap button for recalibrate the distance, right? Correct, you can leave auto lap on. Just make sure the lap size in the app settings of Peter’s (Race) Pacer matches the auto lap size on your watch. (if you autolap by 1k set 1000 meter in app settings, if autolapping every mile set 1609 meter in app settings). Manual lap will apply distance correction. Great data field. Tested it out last weekend. Is the “Ahead” and “behind” time by pace or total estimated time? Ahead/Behind time is the total deviation compared to the expected target time when you run at the expected pace. Eg when your target is to run 10k in 1 hour (6min/km; 10k/h) and you are currently at the 5k point in 29:55 then you are 5 seconds ahead. Also, what is the difference between “Average Pace,” “Perfect Pace” and “Pace”? I saw what “Smooth Pace”is above. The default set up has average pace and pace visible. Just curious what the benefit is if the other fields. I’m the owner of a Fenix3 watch. As I push on the LAP button the screen turns into analogic clock watch face. Can you help me? I don’t have a fenix 3 watch, but we’ll try to figure out what’s going wrong. 1/ Connect your device with usb to your computer and check for error logs. There’s a potential one in the root of the device called err_log.txt and one in the folder \apps\logs\ciq_log.txt. 2/ Can you remove the Peter’s (Race) Pacer data field and then push the lap button. What happens now? 3/ Can you uninstall Peter’s (Race) Pacer, re-download Peter’s (Race) Pacer, assign it back to the run activity profile and push the lap button. What happens now? My garmin 235 pauses the run when I have my stops during a run. Will the race pacer keep this into account and use the total time including the time I paused, or will it affect the perfect pace indication and the time ahead/behind? It might work together with the autopause option, but I’m not sure. This data field is really meant for races, where having the autopause option set is not very relevant (the race clock does not pause when you stop). I would recommend copying the Run Activity profile to a Race activity profile where you disable the autopause option. 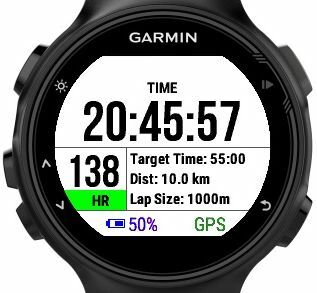 Doing the configuration in Garmin Express, the dropdown menu under Target Type is only showing Target Pace, nothing else (and I would like to use Target Time). I’d suggest you train with the app before taking it to the race. How do I update the Target Pace and Distance on the watch? I have the 735xt and want to be able to make those changes from the watch if possible, as I will be running varying distances throughout any given week. Is the only way to do it through Garmin Express? On Watch configuration is not possible for data fields. I’m training for an Ironman. Do you have feedback of people having use the app during an Ironman ? what’s the impact of the app on the battery ? I expect to do the IM in 12 hours with a running part of 4 hours. Do you think the Forerunner 935 will stand it ? i don’t know the Impact on the battery, but be careful if u use this app in Tri-Mode. I‘ve got a Forerunner 935. Your app supports my trainings much. How can I change the displaybackground into the lighter version as shown at the photos? from within the application settings. How is the ETA calculated? Guessing it either assumes your current pace continues or your average pace continues? 10mi race, goal time is 1:00:00, at the 5mi mark I’m at 0:31:00. Is my ETA 0:59:45 or 1:02:00? The power zone define the 7 power zones, they are used only to color the power value in a specific zone color. For the power value to display something you need a external power meter (a bike power meter when cycling or a stryd when running). Yesterday the 10th of November I walked around 13000 steps and around 5 miles and got 0 credit when I checked it at the end of the day. Peter’s (Race) Pacer is a data field, it shouldn’t have any effect like you describe on Garmin native functionality. Data Fields just enhance native functionality. Cheers, Peter. Hi Peter, I have a race tomorrow and I sent a donation on Nov. 14th. Unfortunately, I haven’t receive the code for the app (Peter’s race Pacer). Could you please look into it? Nevermind! Should have checked the spam folder… it went there! Hello, I’m completly new into Garmin watches. I’m trying to install your app on my new vivoactive 3, but it doesn’t show up! After “Manage Apps”, I can’t see your app anywhere. I syncronised the watch via mobil phone, connected it via pc, I installed Garmin Express, which says, that the app is installed to the clock… but I can’t find it. Am I doing something completely wrong????? I got it!!!!! I’m really getting too old for those new technologies! Hi Peter,I made the 19 euro donation via the link http://starttorun.info/about/ that you posted earlier and I’ve received my confirmation of payment, but no unlock key. When can I expect to receive the code to unlock all your apps? I’ve checked my spam folder etc and nothing!! Sending the donation key mail is a manual process and the key is typically delivered within a day, when you check now you should have received the email. Used the Peter’s (Race) Pacer for a few half and full marathons and while on my training runs. Great app, helped me a lot to reach my goals and always to target PB. So time to send the donation. Done 🙂 Thanks to Peter & keep up the great work. Love this and the other apps. Your pacer seems to be really interesting, I am going to use it for the Paris Marathon next 14th april. Can you tell me if we can personalize the the “Like it? Donate!” message from the data field if I make a donation? Hi Peter I just send a donation, please send me the code! I used this App last year to run the Tokyo marathon and it worked well as they had km markers in Tokyo. This time I am running Boston, where the km markers may not be there or may not be prominently displayed. So I would like to set the lap size to 1609 meters and use manual lap. But I want to have the pace(s) displayed in min/km. Will this work? Also, in this case, should I set the goal pace in min/km or min/mile?